An Islamist militant suicide bomber drove a car into a Mogadishu cafe frequented by members of the security forces on Thursday, killing at least 10 people and blowing the place to bits. Al Shabaab said it had carried out the attack, which followed an assault by its fighters on the president’s palace in the Somali capital last week. “Today’s blast was part of our operations in Mogadishu and we shall continue,” said Sheikh Abdiasis Abu Musab, al Shabaab’s military operations spokesman. He said the attack had targeted security personnel who were sitting in the tea shop, killed 11 of them and wounded 15 others. Police said at least 10 people died at the tea shop, which is popular with security personnel as it is near their compound. Although Al Shabaab was driven out of the capital and other major centres in the past two years, it still controls swathes of the countryside and mostly smaller towns. It has continued to wage a bombing campaign in Mogadishu, harming goverment efforts to exert control over areas it governs. Somalia, which is slowly emerging from two decades of conflict and anarchy, is struggling to rebuild its national security forces. For now, the government still largely relies on an African peacekeeping force, AMISOM. Somalia’s African neighbours and Western nations worry that the space still controlled by al Qaeda-aligned al Shabaab provides a launch pad for broader operations. The group staged a raid on a Nairobi shopping mall last year, killing 67 people. AMISOM has just been reinforced with Ethiopian troops, taking it to about 22,000 soldiers, and is expected to launch a new campaign against al Shabaab strongholds soon. Driving al Shabaab out of its strongholds could improve aid access in a nation where 3 million people require humanitarian assistance and a third are in dire need. But U.N. officials worry an offensive now could disrupt the planting season and so hurt harvests in Somalia, which suffered a famine 2011. 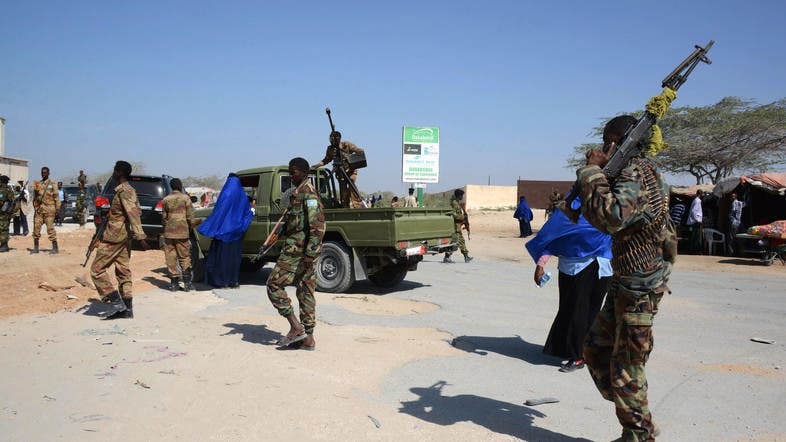 Al Qaeda-allied al Shabaab ruled most of southern Somalia from 2006 until 2011 when forces from other African nations sent by the African Union drove them out of Mogadishu and then expelled them from most urban centres.